Welcome to new joiners Alson, Chloe, Christopher, Deb, Emily, James, Louise, Melissa, Monica, Nicki, Nikki and Vasundhara. Some newsletter readers (well, my wife actually) have suggested that the relevant suburb be added to the lists of upcoming events and I’ve now started doing this. I’ve also changed the format of the new events a bit so that it better aligns with that of the lists. If you ever have any suggestions for how the newsletter could be improved, email me. 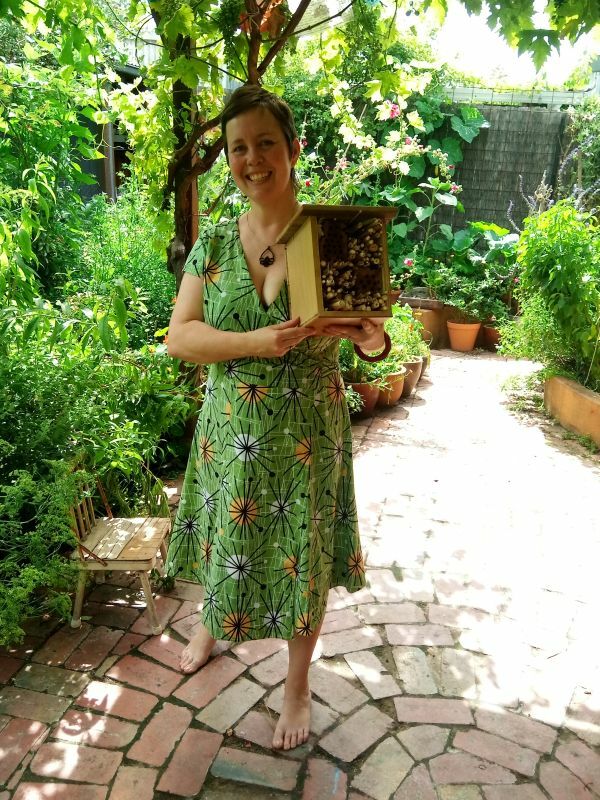 Many of you will have come across Katrina through her native bee hotel workshops (under the banner of Buzz and Dig), through her involvement in ShareWaste, or as one of the prime movers of the Transition Darebin food swaps. Judy Vizzari has now interviewed Katrina as a home grower. As Judy says, “Katrina and her husband, Matthias, have lived with their two small children in their home for five years and during that short time have converted their back yard from a grassy suburban block into a productive food producing forest.” Also, “Katrina’s garden and her life seem to be a blend of practices which complement each other and extend outwards into her community. They include ‘ShareWaste sharing’, composting, worm farming, chicken husbandry and, of course, encouraging native bee populations. Each of these benefits her productive food garden, her family and her community. It’s a cycle.” Read the full interview. Incidentally, Katrina is leading two workshops on Saturday in her back garden in Preston: Attracting native bees on Saturday, 16th February, 10-11.30am; and Composting at home workshop: Saturday, 16th February, 12.30-2pm. 3rd Saturday of the month, 9.30am-midday. At Croydon Herbal Health, 2/48 McAdam Square, Croydon, 3136 (the entrance is on Plymouth Road opposite The Good Shepherd Lutheran Primary School). Organised by Croydon Herbal Health. Email: Emily at [email protected]. Phone: 0432 613475 or 9723 9755. Their Facebook page. Welcome Emily and Monica! There are now 33 regular food swaps in North East Melbourne – have a look at the list and map. They arguably cover the whole of the area, with the exception of ‘a black hole’ in the middle which roughly coincides with Manningham. The Fawkner food swap has moved in both space and time, and is now at Fawkner Food Bowls (corner of Creedon and Lorne Streets) on the 2nd Sunday of every month, 10.30am-12.30pm. The winner of the random draw for a bottle of Imbue Distillery’s gin is Cara Horner from Epping. In the picture, Cara (left) is receiving her bottle from Imbue’s Mel Sheard (right). Commiserations to everyone else who entered the competition. Each year, Leaf, Root & Fruit organise a tromboncino grow challenge competition – grow the longest tromboncino and you could win a 2-hour onsite consultation. Closing date 29th April. As pictured, last year’s winner was 1.4m long. Incidentally, I’m not sure why some people call ‘tromboncino’ ‘zucchini tromboncino’: whilst tromboncino is a cultivar of Cucurbita moschata, zucchini is a cultivar of Cucurbita pepo. There is a really yummy recipe for tromboncino soup on our website. It has rice in it and tastes a bit like potato soup. Finally, I’ve revamped the overall recipe page on the website. You can now sort or filter the list by any of course, season, author or ingredient. 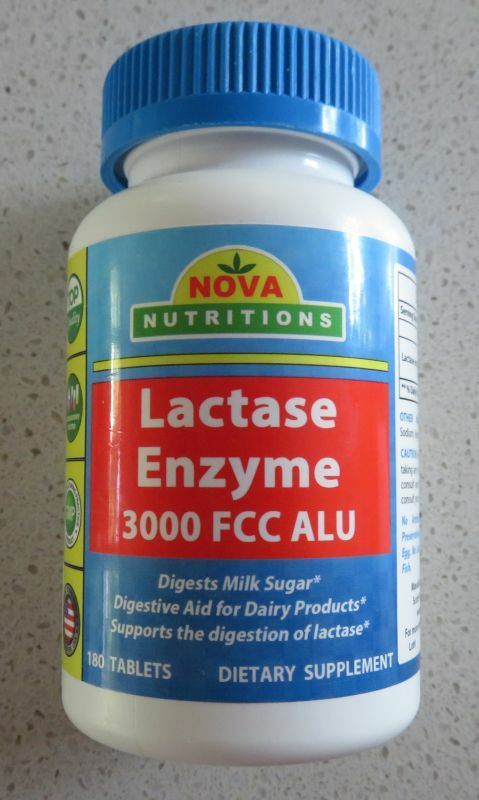 Someone gave me a bottle of lactase tablets but I’m not lactose intolerant. Use by April 2020. 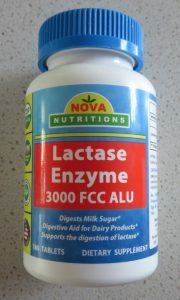 If you are lactose intolerant but want to drink some milk, email me and I’ll give you the bottle. If multiple people email me, it will be a random draw. They are asking for comments on the draft material, closing date 11th March. If only my Council could produce something along these lines! Helen Simpson’s article Growing ginger and turmeric in Melbourne – can it be done? is one of the most popular pages on our website. 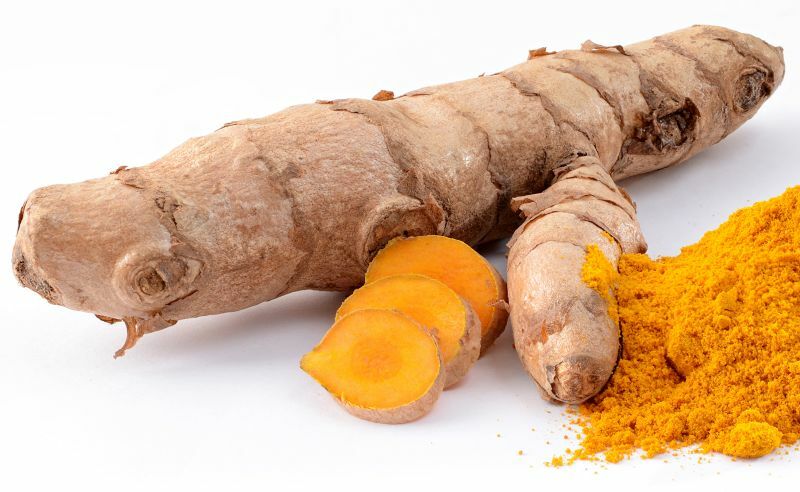 Newsletter reader Angelo Eliades has now weighed in with an article entitled Growing turmeric in containers in temperate climates. “These delicious peas should be grown at home, as their sugars convert to starches once picked, so half of the sugars are gone within an hour of picking. You’ve never tasted a snow pea unless you have picked it yourself.” Read the article. This appears to be the first article on the Permablitz website that has been written by newsletter reader Samantha Allemann, who also writes for Pip magazine. Read about more Permablitz heroes of the month. Community currency information evening – LETS: Monday, 18th February, 7-8pm; Watsonia Neighbourhood House. What: Go along and workshop what goods and skills you may have to trade with others. Hear about what you can access that may be available locally and through online platforms. Facilitated by Marina Bistrin from LETS Diamond Valley. Light refreshments available. Quite a lot of the new events below are from the Melbourne Food and Wine Festival, which takes place Friday, 8th March to Sunday, 24th March. Insights from one researcher’s journey to understand gardens, health and wellbeing: Thursday, 14th February, 6.30-7.30pm; CERES. What: From a community-informed, community-based descriptive approach to the launch of a randomised controlled trial. In this talk, Dr Jill Litt, from IS Global in Barcelona and University of Colorado Boulder, will review the research findings from her 10-year community-academic partnership with Denver Urban Gardens and describe the Community Activation for Prevention Study (CAPS), a 4-year randomised controlled trial of community gardens in Denver. Plant tales and cold ales: Tuesday, 19th February, 6-8.30pm; Brunswick. What: An evening for plant lovers by plant lovers, with cold ales and plant-based eats being served up in the garden. Hear from Jason Chongue (The Plant Society), Plant Mama, David Irwin (Patient Wolf Gin) and Nick Casey (Howler) on how the power of plants inspire their creative craft. Fruit beer and cheese pairing masterclass: Saturday, 23rd February, 12.30-2.30pm; Thornbury. What: What you will learn: taste your way through fruit beers from The 3 Ravens under the expert guidance of one of their brewery team and a cheese expert from Harper & Blohm; see behind the scenes of a fully functioning craft brewery; and learn The 3 Ravens approach to fruit beers. What you will get: brewery tour; lunch; and guided tasting of all varieties of fruit beer. From wine grapes, to apricot, blueberries, strawberries and pears, The 3 Ravens love adding some fruit to enhance their brews. Burnley Brewing tour and tastings: 4 occurrences during March on Friday 8th, Saturday 9th, Saturday 23rd and Sunday 24th, each 6.30-7.30pm; Burnley Brewing. What: Enjoy the house brews while meeting the brewers at Burnley Brewing and walking through their brewing process, the varied ingredients that go into each beer, and how these additions shape every beer’s taste and appearance. Then, you’ll get a chance to sample the beers during the fermentation phase, poured straight from the tanks of our in-house brewing system. Your will also receive two entrees to accompany your beverages. This event will not only teach you about different beer styles and their origins, but also how to best pair beer with food. The art of Japanese breakfast: 2 occurrences during March on Saturday 9th and Saturday 23rd, both 8.30-10.30am; Collingwood. What: Traditional Japanese breakfast comprises many small homely dishes made with seasonal ingredients. Guests will observe each element of the meal coming together and explore objects of classic Japanese design. CIBI owners Meg and Zenta Tanaka will share stories and explain the Japanese philosophy of food and its relationship to design before serving a traditional Japanese breakfast. Food as medicine: Saturday, 9th March, midday-4pm; Fitzroy. What: Join Anada’s Maria Kabal as she explores native Australian ingredients and their ability to heal as well as nourish over a four-course lunch featuring wild meats and seafood and locally-sourced indigenous curative ingredients. Vegan smokehouse BBQ collaboration: 4 occurrences during March on Saturday 9th, Sunday 10th, Saturday 23rd and Sunday 24th, each midday-2pm; Collingwood. What: American BBQ institution Le Bon Ton joins forces with Green Burger in this multi-course feast of 100% vegan interpretations of American smokehouse favourites. There will be cocktails plus natural wines paired with each course – smoked hot links, mac and cheese, pulled pork and fried chicken, all completely plant-based. Lygon Street – Si Mangia Italiano (film): Sunday, 10th March, 5.30-7.30pm; Cinema Nova, Carlton. What: Lygon Street – Si Parla Italiano is a homage to the Italians who changed the way that Melbourne thought about food, drink and dining. Sip a glass of Italian red wine, relish themed canapés and a gift bag as you enjoy a pre-feature discussion about the contribution that European migrants made to Melbourne’s culture before a screening of the documentary. Discover the people, places and (of course) the pasta that made Carlton a cultural epicentre. Narrated by Anthony LaPaglia. A slice of spice (curry meets pizza): Monday, 11th March, at 6-7.45pm and again at 8-9.45pm; 400 Gradi, Brunswick East. What: Johnny Di Francesco from 400 Gradi and Jessi Singh of Horn Please, Babu Ji NYC and Don’t Tell Aunty fame are joining forces to create the perfect Indian-Italian cross-cultural marriage. Experience the flavour explosion of wood-fired Neapolitan pizza topped with an array of aromatic curries and Indian spices. Richmond Grain Groupies grain crawl: Wednesday, 13th March, 6-9pm; Richmond. 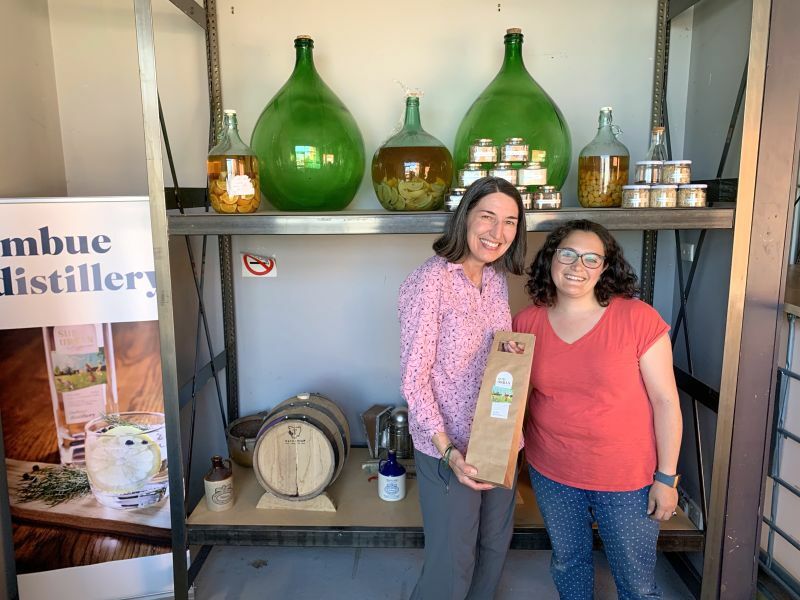 What: Celebrate all things grain as you go behind the scenes of Phillippa’s Bakery, Mountain Goat Brewery and Brogan’s Way Distillery to see how grain is used to create three distinct products. Learn the processes of fermenting wheat for a sourdough culture, brewing malt for beer, distilling grain spirit to make gin, and how to add botanicals to all the products to create subtle nuances of flavour. Tastings too! Great cheese is made in the maturing room: Saturday, 16th March, 4.30-7.30pm; Yarra Valley Dairy, Yering. What: Join cheesemakers, Jack Holman from Stone & Crow and Yarra Valley Dairy and Nick Haddow from Bruny Island Cheese Co. and Glen Huon Dairy, as they guide you through a tasting of cheeses they have matured in different ways and in different places. Most people would think that cheese is made in a vat. However, it’s the art, craft and science of maturation that is hugely responsible for turning good cheese into great cheese. Taste and compare the same batches of cheese, aged in three different locations. Beale Street BBQ blues (vegan): Saturday, 23th March, midday-2pm and again at 2.30-4.30pm; Brunswick East. What: Memphis-style cooking, featuring mock meat and vegetables, together with drinks and music. The menu: to start – sweet potato crisps with BBQ salt and jalapeno hush puppies with maple butter; mains – BBQ vegan brisket, southern fried mock chicken, smoked corn, queso fresco & vegan aioli, chipotle mac’n’cheese, and green goddess salad; sweet – banana cream pie and smoked meringue. Worm farming and composting: Sunday, 31st March, 11am-12.30pm; Richmond. What: Learn about Finbar’s worm farming and compost systems and choose a system that’s right for you. Kath Jones will show you how to keep your system working well, avoid common mistakes and troubleshoot problems. Alpha & Omega – Hellenic masterclass: Saturday, 9th March, 11am-1pm; Kew. What: Learn how to make Greek mezethes and sweet treats with chef Travis McAuley. Then settle in for a three-course lunch at Hellenic Republic Kew. Cheese class: Sunday, 10th March, 9.30-11.30am and again at midday-2pm; That’s Amore Cheese, Thomastown. What: Hosted by That’s Amore’s Giorgio Linguanti. Learn how to make your own Italian cheese from scratch. Veterans vs virgins at Preston Market: Friday, 22nd March, 6.30-10.30pm; Preston Market. What: Join the excitement as some of Preston Market’s most distinguished veterans take on the new kids on the block in a fun-filled no-holds-barred cook-off. You also get to join in, helping make everything from pasta to paella and seafood to sandwiches while guiding your chosen team to victory and picking up cooking tricks and techniques along the way. How to pull noodles: Saturday, 23rd March, 10-10.45am; Box Hill Central. What: Watch and participate in a hands-on cooking demonstration of how to pull noodles. How to make the perfect dumpling: Saturday, 23rd March, 12.30-1.15pm and again on Sunday, 24th March, 1.30-2.15pm; Box Hill Central. What: Watch and participate in a hands-on cooking demonstration of how to make the perfect dumpling. How to make perfect sushi: Sunday, 24th March, 11-11.45am; Box Hill Central. What: Watch and participate in a hands-on cooking demonstration of how to make perfect sushi. Cooking master class – ‘Spanish inspired’: Friday, 29th March, 7-9pm; Gourmet Living, Templestowe. What: Enjoy 3 tasting size courses cooked by chef Bek McMillan, from Gourmet Living, who will demonstrate step by step. All recipes are included. Menu: pintxos; spicy paella; and torrijas. Preparing your garden for Autumn harvest: Thursday, 14th February, 7-8.30pm; Edendale. GreenMe Brunswick tour: Friday, 15th February, 1-4pm; Brunswick East. Attracting native bees: Saturday, 16th February, 10-11.30am; Preston. Edible weeds of Melbourne: Saturday, 16th February, 10am-midday; Joe’s Market Garden, Coburg. Composting at home workshop: Saturday, 16th February, 12.30-2pm; Preston. Home composting workshop: Saturday, 16th February, 2-4.30pm; Edendale. The art of watering: Saturday, 16th February, 3-4.30pm; Macleod Organic Community Garden. Pop up garlic farmer information evening: Saturday, 16th February, 5-8pm; Joe’s Market Garden, Coburg. Farmer to table dinner: Saturday, 16th February, 7-10pm; CERES, Brunswick East. Weed cold composting: Sunday, 17th February, 9.30-10am; Eltham Farmers’ Market. Weed cold composting: Sunday, 17th February, 11.30am-12.30pm; Alphington Farmers’ Market. Farm play: Tuesday, 19th February, 10am-midday; Joe’s Market Garden, Coburg. Bush skills and kids farming: Tuesday, 19th February, 4-5.30pm; Joe’s Market Garden, Coburg. Backyard beekeeping with Benedict Hughes: Tuesday, 19th February, 6-7.30pm; Thornbury. Seed saving: Tuesday, 19th February, 6.30-8.30pm; Fitzroy North. Growing bountiful harvests in small spaces: Wednesday, 20th February, 6.15-8pm; Collingwood Childrens Farm, Abbotsford. Healthy productive compost and worms: Thursday, 21st February, 6.30-9pm; Bulleen Art and Garden. Bee hive tour: Saturday, 23rd February, 10.30am-12.30pm; Rivers of Yarrambat. Introduction to permaculture (two sessions): Saturday, 23rd February and Sunday, 24th February, both 10am-4pm; Edendale. Brewers Feast Festival: Saturday, 23rd February, 11.30am-8pm; The Abbotsford Convent. Seed saving workshop at The Plummery: Sunday, 24th February, starting at 10am; Northcote. Weed composting and veggie swap: Sunday, 24th February, 10.30am-midday; Watsonia Neighbourhood House. Brewers Feast Festival: Sunday, 24th February, 11am-5pm; The Abbotsford Convent. Heritage apple tasting: Sunday, 24th February, 5-7pm; Petty’s Orchard, Templestowe. Introduction to horticulture – 9 session course: every Monday for 9 weeks, starting 25th February, 9.30am-3pm; Edendale. Farm play: Tuesday, 26th February, 10am-midday; Joe’s Market Garden, Coburg. Bush skills and kids farming: Tuesday, 26th February, 4-5.30pm; Joe’s Market Garden, Coburg. Growing your veggies: Tuesday, 26th February, 6.30-8.30pm; Fitzroy North. Medicinal herbs workshop: Wednesday, 27th February, 6.30-8pm; Whittlesea Library. Summer fruit tree maintenance: Thursday, 28th February, 6.30-9pm; Bulleen Art and Garden. Farm play: Tuesday, 5th March, 10am-midday; Joe’s Market Garden, Coburg. Bush skills and kids farming: Tuesday, 5th March, 4-5.30pm; Joe’s Market Garden, Coburg. The practical beekeeper: Wednesday, 6th March, 1-2.30pm; Rosanna Library. 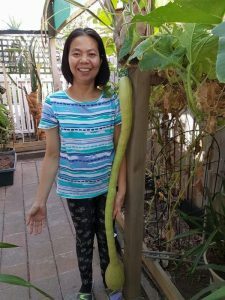 Growing fruit and veggies in small spaces: Thursday, 7th March, 6.30-9pm; Bulleen Art and Garden. Burnley Brewing tour and tastings: Friday, 8th March, 6.30-7.30pm; Burnley Brewing. The art of Japanese breakfast: Friday, 9th March, 8.30-10.30am; Collingwood. Vegan vegastation yumcha! : Saturday, 9th March, 11.30am-4.30pm; Fitzroy. Vegan smokehouse BBQ collaboration: Saturday, 9th March, midday-2pm; Collingwood. Burnley Brewing tour and tastings: Saturday, 9th March, 6.30-7.30pm; Burnley Brewing. Vegan smokehouse BBQ collaboration: Sunday, 10th March, midday-2pm; Collingwood. A slice of spice (curry meets pizza): Monday, 11th March, 6-7.45pm; 400 Gradi, Brunswick East. A slice of spice (curry meets pizza): Monday, 11th March, 8-9.45pm; 400 Gradi, Brunswick East. Edible weeds: Monday, 11th March, 10am-midday; CERES, Brunswick East. Farm play: Tuesday, 12th March, 10am-midday; Joe’s Market Garden, Coburg. Bush skills and kids farming: Tuesday, 12th March, 4-5.30pm; Joe’s Market Garden, Coburg. Make beeswax wraps: Wednesday, 13th March, 1-3pm; Rosanna Library. RetroSuburbia – David Holmgren presents ‘Aussie Street’: Thursday, 14th March, 6.30-9pm; Brunswick. 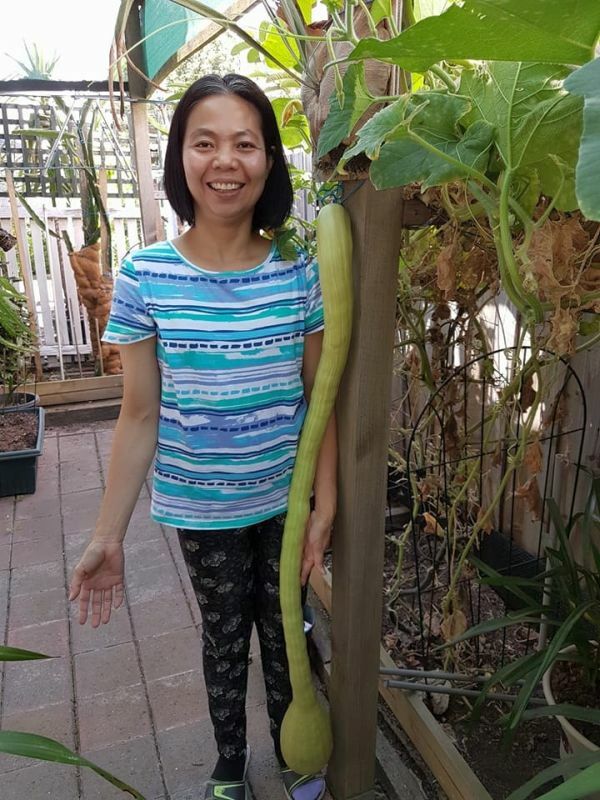 Veggie gardening for beginners: Saturday, 16th March, 9.30am-12.30pm; Bulleen Art and Garden. Organic gardening for beginners: Saturday, 16th March, 10am-3pm; Edendale. The Herb and Chilli Festival: Saturday, 16th March, 10am-5pm; Wandin. Success with seedlings: Saturday, 16th March, 2-3.30pm; Central Ringwood Community Centre. The Herb and Chilli Festival: Sunday, 17th March, 10am-5pm; Wandin. Food know how – zero waste cooking: Wednesday, 13th February, 6-8pm; North Fitzroy Library. Summer preserves: Saturday, 16th February, 9.30am-12.30pm; Bulleen Art and Garden. Getting started with sourdough: Saturday, 16th February, 10.30-11.30am; Brunswick Library. Mozzarella and ricotta cheesemaking workshop: Sunday, 17th February, midday-2.30pm; Bee Sustainable, Brunswick East. Turkish cooking demonstration: Monday, 18th February, 7-8pm; Coburg Library. Tomato relish workshop: Thursday, 21st February, 11am-midday; Diamond Valley Library. Cook Indian by the creek: Friday, 22nd February, 6-7.45pm; Diamond Creek. No waste cooking workshop: Sunday, 24th February, 10am-2pm; Burnley. The Beet Retreat – eating vegan on a budget (4 hour): Sunday, 24th February, midday-4pm; Smiths Gully. Preserving your harvest workshop at The Plummery: Sunday, 24th February, starting at 1pm; Northcote. Taste of Malaysia (Peranakan): Tuesday, 26th February, 10am-midday; Ringwood North. Cook Indian by the creek: Friday, 1st March, 6-7.45pm; Diamond Creek. Thermomix Flavours of India – demonstration-style cooking class: Friday, 1st March, 6.30-8.30pm; Chirnside Park. Decorating kids cakes with Emelia Jackson: Friday, 1st March, 7-9pm; Gourmet Living, Templestowe. Mozzarella and ricotta cheesemaking workshop: Saturday, 2nd March, 9-11.30am; Bee Sustainable, Brunswick East. No Waste Cook Club: Saturday, 2nd March, 10am-midday; North Fitzroy Library. Nuka zuke – rice bran pickling: Saturday, 2nd March, 11am-1pm; Preston. Preserving summer produce: Sunday, 3rd March, 10am-1pm; Fitzroy North. Kombucha tea workshop: Sunday, 3rd March, 10.30am-midday; Central Ringwood Community Centre. Shio koji making and cooking: Sunday, 3rd March, 11am-1.30pm; Preston. Mozzarella and ricotta cheesemaking workshop: Sunday, 3rd March, midday-2.30pm; Bee Sustainable, Brunswick East. The Beet Retreat – ‘practically raw’ gluten free vegan un-cooking class (4 hour): Sunday, 3rd March, midday-4pm; Smiths Gully. Cooking for baby and toddler (thermomix): Tuesday, 5th March, 7.30-9pm; Kilsyth. The Beet Retreat – ‘practically raw’ gluten free vegan un-cooking class: Thursday, 7th March, 6.30-8.30pm; Smiths Gully. Cooking master class – Italian feast: Thursday, 7th March, 7-9pm; Gourmet Living, Templestowe. Cook Indian by the creek: Friday, 8th March, 6-7.45pm; Diamond Creek. Miso paste making: Saturday, 9th March, 11am-1.30pm; Preston. Sourdough bread workshop: Saturday, 9th March, 9-11.30am; Bee Sustainable, Brunswick East. Cheese class: Sunday, 10th March, 9.30-11.30am; That’s Amore Cheese, Thomastown. Cheese class: Sunday, 10th March, midday-2pm; That’s Amore Cheese, Thomastown. Pickle and preserving: Tuesday, 12th March, 7-8.30pm; Hawthorn Community House. Cooking master class – ‘lamb madness’: Thursday, 14th March, 7-9pm; Gourmet Living, Templestowe. Cook Indian by the creek – Holi special: Friday, 15th March, 6-7.45pm; Diamond Creek.